Exactly one week from today, the annual consumer craze of Black Friday will commence across the U.S. and people will wait in long lines, get really hyped up, move around wildly and, of course, spend money. The funny thing is, depending on how it’s described, this very scenario sounds just like another event that will also be taking place one week from today. 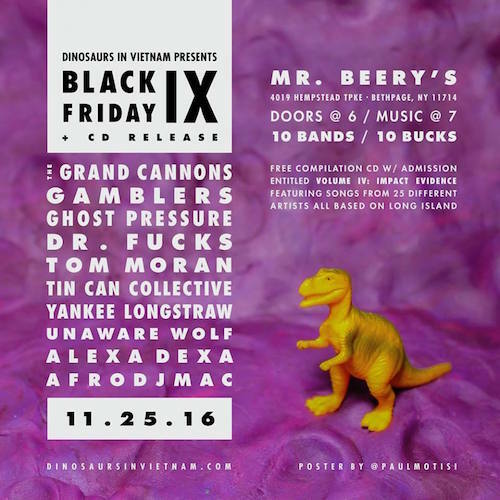 Every year for the past eight, Long Island, NY based DIY artist collective, Dinosaurs in Vietnam, has put together and hosted a massive showcasing of bands from around the local area, which runs deep into the night each Black Friday. The bill of artists for next week’s show traverses styles from folk pop to electronica, indie rock, experimental, R&B, and more. 2016 marks the ninth installment of post-shopping festivities and in addition to assembling a diverse, 10 band lineup, Dinosaurs in Vietnam will be celebrating the release of its newest compilation album titled, “Volume IV: Impact Evidence” (Volumes I, II, and III are available through Bandcamp). The fourth record comes with all admissions to the show and features an impressive assortment of 25 artists exclusively from the Long Island community. 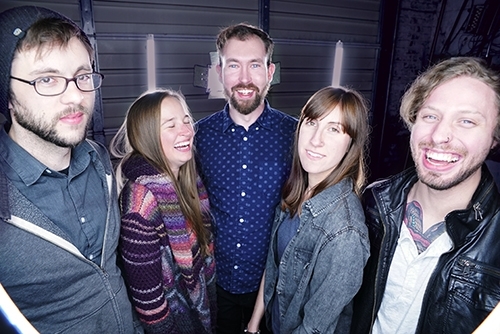 One of the bands slated to play the “Black Friday IX,” Ghost Pressure (Nicholas Post-Guitar/Vocals, Nicholas Femister-Bass, Karina McMahon-Drums, David Hodgkinson-Guitar), is a band known for infusing a twist of avant-garde into their indie rock base. Steadily growing and evolving from their small town, Babylon, NY beginnings back in 2014, Ghost Pressure have become a staple name of the Long Island music scene. Years of enthusiasm and dedication has seen the band bring their style of sound to increasingly recognized venues, clubs, and even an out-of-state stoop or two, along the east coast. The flyer for “Black Friday IX” might not mention Ghost Pressure’s new reveal outright but Post and the rest of Ghost Pressure saw their inaugural inclusion in this year’s show as just the occasion to commemorate the new lineup’s first public performance.“We’re especially honored to play Black Friday IX. This is our first time playing the show and this is one of those shows that I look forward to every year. Will Forthman of Dinosaurs in Vietnam has been working hard for the Long Island music scene for over a decade.” In hearing Post’s deep gratitude, it is not difficult to understand why, despite perhaps sometimes being overshadowed by New York City, Long Island’s musicians persist – enthusiastic and determined as ever – to get out there. “So many of the artists on the bill are our personal friends and to me, I look at it like a yearly reunion for the Long Island scene, in a way. As our homegrown bands grow up and do their thing all over the east coast and even the country, it’s wonderful to see everyone come together.” Whether Long Island, NY or some other small community locale, shows like Dinosaurs in Vietnam’s “Black Friday” represent an annual re-invigoration of a music community’s many goals and most importantly, its friendships. “Black Friday IX” happens in seven days, on 25 November 2016. Full show information is below.